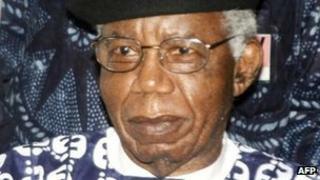 Nigeria's President Goodluck Jonathan regrets acclaimed author Chinua Achebe's rejection of a prestigious national award, his spokesman says. Mr Achebe said the concerns he raised about Nigeria when he first rejected the award in 2004 remain unresolved. At the time, Mr Achebe said the situation in poverty and violence-hit Nigeria was becoming worse. Nigeria's presidential spokesman said his continued rejection was surprising and "flies in the face" of reality. Mr Jonathan won elections in April that were hailed by foreign observers as free and fair. But an estimated 500 people were killed and thousands displaced from their homes in northern Nigeria in post-election violence after supporters of the main opposition Congress for Progressive Change (CPC) party denounced the result as fraudulent. Presidential spokesman Reuben Abati said Mr Jonathan was surprised that Mr Achebe - who gained worldwide fame for his novel Things Fall Apart - had turned down the Commander of the Federal Republic award, Nigeria's second highest honour. "Politically, Nigeria cannot be said to be where it was in 2004 as the Jonathan administration has embarked on extensive electoral reforms," Mr Abati said in a statement. He said Mr Achebe - who lives in the US - was probably unaware of the true situation in Nigeria. "The president continues to hold Prof Achebe in very high esteem in spite of his regrettable decision... and hopes he will find time to visit home soon and see for himself the progress being made by the Jonathan administration," Mr Abati said. Mr Achebe first rejected the award when it was offered to him by then-President Olusegun Obasanjo, who took power after military rule ended in 1999. At the time, Mr Achebe said his decision was intended to serve as a "wake-up" call and he hoped that "change" would be achieved through protests. He was most scathing about the situation in his home state of Anambra in the south-east. "A small clique of renegades, openly boasting its connections in high places, seems determined to turn my homeland into a bankrupt and lawless fiefdom," Mr Achebe told the BBC in 2004. The 80-year-old Nigerian author, who was paralysed from the waist down after a car accident in 1990, won the Man Booker International Prize in 2007 for his literary career. Two years later he visited Nigeria for the first time in a decade as part of celebrations to mark the 50th anniversary of the publication of Things Fall Apart. Nigeria is Africa's major oil producer but two-thirds of its population is poor. It is one of the most corrupt countries in the world and is often hit by ethnic, religious and political violence.